Panasonic finally reveals the full specs for its full frame mirrorless cameras. After months of speculation since the initial reveal back at Photokina in September 2018, the Panasonic Lumix S camera range is now official. While most eyes will be on the Panasonic Lumix S1R, the Panasonic Lumix S1 has lots to consider as well. Like Sony and Nikon, Panasonic has targeted two cameras at two different markets. The 47-megapixel S1R is aimed at professional/commercial photographers who require the maximum possible image quality, while the 24-megapixel Panasonic Lumix S1 is more of an affordable all-rounder, likely to appeal to enthusiast stills shooters but also professional videographers. The S1 comes with a 24-megapixel full-frame CMOS. The Panasonic Lumix S1 has a 24-megapixel full-frame CMOS sensor paired up with a new Venus processing engine. This gives a maximum standard sensitivity of ISO 51,200, the same as its key rivals, the Nikon Z6 and Sony A7 III. 5-axis image stabilisation is built in, using vibration measurements from a gyro sensor, information from the CMOS sensor itself and an accelerometer to provide a claimed 5.5-stop maximum shake compensation. But this works in combination with a 2-axis optical stabiliser in Lumix S series lenses to provide up to 6 stops of compensation. Hybrid stabilisation systems combining in-body and lens stabilisers are definitely catching on. Panasonic has launched three S series lenses alongside its new cameras, and these use the Leica L mount first shown at Photokina 2018, developed as part of an ‘L-mount alliance’ made up of Panasonic, Leica and Sigma. The S1's lenses use the Leica L mount. The in-body stabilization mechanism brings another benefit – a 96-megapixel High Resolution Mode. This combines the data from eight different exposures, each made with a minute shift in the sensor position, to produce a 12,800 x 8,000 pixel raw file. These systems usually need a static subject, but Panasonic says there is an option to suppress motion blur. Interestingly, the Leica L mount has a width of 54mm, only slightly narrower than the 55mm of the Nikon Z mount and a lot wider than the 46mm of the Sony E mount. Nikon has trumpeted the importance of a wide mount for new lens designs, Sony says it doesn’t matter. We’ll find out soon enough. Where rival full frame mirrorless camera makers have introduced on-camera phase-detection autofocus, Panasonic is sticking with its contrast-based DFD (Depth from Defocus) system. With communication speeds between the camera, lens and processor up to 480fps, Panasonic claims the system can react in just 0.08sec. It’s also highly sensitive, working down to a claimed -6EV. It remains to be seen whether this AF system can compete with rivals for speed, but the S1 does lag slightly in burst shooting capability. Its top continuous shooting speed of 9fps is slightly down on its Sony and Nikon rivals and only achieved with focus locked on the first frame – with continuous autofocus, the speed drops to 6fps. The Lumix S1 can, however, fall back on a new 6K Photo mode, which can capture 18-megapixel images at 30fps, or Panasonic’s regular 4K Photo mode (8 megapixels images) which offers 30fps or 60fps. Any shortfall in continuous shooting specs is quickly made up for in video performance. The Lumix S1 uses the full sensor width, so there is no ‘crop factor’ for your lenses, and can capture 4K video at up to 60/50p. It can capture 4:2:0 8-bit video internally to a memory card or 4:2:2 video to an external recorder via HDMI. That’s not all, though. Later in 2019 a software upgrade will allow 4K 60/50p 4:2:2 10-bit recording via HDMI, and 30/25/24p 4:2:2 10-bit recording internally – plus Panasonic’s V-Log option. There is a time limit on 4K video shot at 50/60p, but 4K/30p and full HD have no time limit. The Lumix S1’s video credentials are further extended by 3.5mm mic and headphone sockets, and the ability to add the Panasonic DMW-XLR1 mic adaptor to the camera’s accessory shoe to support professional XLR mics and other input devices. Panasonic says the Lumix S1 is designed to withstand heavy professional use. It has magnesium allow die-cast front and rear panels and sealing at every joint, dial and button. It’s dust and splash resistant and operates down to -10 degrees. It all has a claimed 400,000-shot shutter life. What’s especially interesting is the decision to offer two card slots – one for UHS II compatible SD cards and one for XQD, a format which is now slowly gaining ground in cameras with high-speed data capture, though the signs are that it may soon be superseded by the physically identical CFexpress format – and Panasonic says CFexpress compatibility will come “in the near future”. The electronic Real View Finder looks especially interesting. It uses a 5,760k dot OLED display, the highest resolution in the world at the time of the camera’s launch, with a refresh rate of up to 120fps and a 10,000:1 contrast ratio. Panasonic claims virtually non-existent lag with a response time of 0.0005sec to allow smooth motion tracking. Fast moving subjects have always caused problems for EVFs in the past, with blur, lag and ‘smearing’, so it will be interesting to see if Panasonic has solved this problem. The S1's 3.2-inch 2,100k dot touchscreen has a tri-angle tilt. On the back of the camera is a 3.2-inch 2,100k dot touchscreen display with a ‘tri-angle’ tilt to allow angled shooting in both horizontal and vertical orientation. There’s also a backlit status display on the top of the camera, which Panasonic says is the largest in its class. The large rear screen and status panel put the Lumix S1 closer to the Nikon Z6 in design than the Sony A7 III. 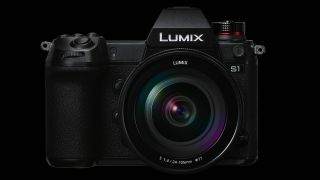 So right now it looks as if the Panasonic Lumix S1 has a number of very interesting features, though no decisive advantage over its rivals – except for its 60/50p 4K video capability. The full frame mirrorless market is certainly hotting up, but as yet there doesn’t appear to be any clear winner, and if the S1 is to make its mark it will have to be through solid performance and a developing reputation rather than any single technological advantage. The Panasonic Lumix S1 price, UK wise, is £2,199.99 /$2,499 (body only) and £2,999.99 / $3,399 with a 24-105mm lens. The Panasonic Lumix S1 release date is 18 March. Time will tell if the Panasonic Lumix S1 will hit our best mirrorless camera list.